MIAMI (AP) Wayne Ellington attempted 16 3-pointers to set a Miami Heat franchise record, and yes, that was an important element in what happened on Friday night against the New York Knicks. It’s not why the Heat won, however. The little plays – Ellington throwing his body onto the floor to corral a loose ball late in regulation, James Johnson shaking off the sting of an 0-for-7 night to create the turnover that put Miami up for good – were what mattered most, at least from the Heat perspective. They moved a season-high four games over .500 by holding off the Knicks 107-103 in overtime on Friday night, with Ellington’s 24 points leading the way. Goran Dragic added 19 for Miami, which set a team record by attempting 42 3-pointers – as well as a team record by missing 30 of them. Josh Richardson scored 18 and Tyler Johnson added 16 for Miami, which went 19 for 20 from the foul line, 10 for 10 in the fourth quarter and overtime. Doug McDermott’s 3-pointer with 1.1 seconds left in regulation sent the game to overtime, and the Knicks led twice in the extra session. Miami finished the game on a 7-2 spurt, started by a 3 from Ellington with 2:22 remaining. Courtney Lee scored 24 for New York, which got 20 from Michael Beasley – who missed most of overtime after turning his ankle – and 15 from Kristaps Porzingis. The Knicks lost despite shooting 49 percent and holding the Heat to 40 percent. The game was tied for the 15th and final time with a half-minute left, when James Johnson managed to break up Jarrett Jack’s pass from near the top of the key for a turnover. That led to Richardson making two free throws a few seconds later, the Knicks missed two shots in the last 13 seconds and Miami survived. The Knicks were down 10 early in the third, but went on runs of 7-0 and 9-0 on the way to taking an 86-80 lead midway through the fourth. Miami scored the next six, getting back-to-back 2-pointers from Ellington – a rarity for him, but they were needed. 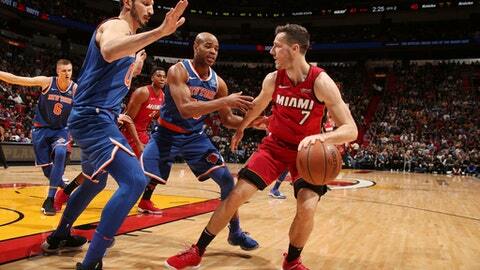 That set up a back-and-forth in the final minutes of regulation, where the Knicks took the lead three times, Miami kept answering and McDermott sent it to overtime – where, after four more lead changes and two more ties, the Heat finished it off. ”These games, right here, show character,” Ellington said. Knicks: Tim Hardaway Jr., still out with a leg injury, warmly greeted several Heat broadcasters pregame. Tim Hardaway Sr. is one of three Heat players to have his Miami jersey retired, and his son is well-regarded by the franchise. … The Knicks didn’t make a 3-pointer until Porzingis connected about 3 minutes into the third quarter. They were 5 for 13 from deep. Heat: Miami has won its last 10 January games. … The three-game winning streak matches a season-best for Miami. … Derrick Jones Jr. became the 239th player to get time in a Heat uniform, and the 238th to score. Heat guard Dion Waiters has sought a second opinion on his sprained left ankle – which could be an indicator that he may not wait until the offseason for surgery. Officially, his status hasn’t changed. ”He’s still doing his rehab, he’s doing his treatment,” Spoelstra said. Friday was the fifth game Waiters missed since aggravating the sprain, which has bothered him since March. Knicks: Visit Dallas on Sunday. Heat: Host Utah on Sunday.